Borderlinx | Buy Alessi and ship worldwide with Borderlinx. Cheap rates guaranteed. When it comes to kitchen utensils, the Italian company Alessi is what's best, combining good quality and playful design. Some of the most memorable designer kettles, toothbrushes, graters and were Alessi products. Alessi has been collaborating with the best designers and companies to create iconic tableware items made in the finest material, like nickel, chromium or silver-plated brass. Alessi's goal is to search for the best aestheticism, design and functional quality applied in a way that appeals to the mass market. 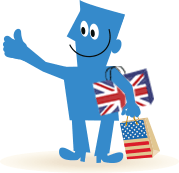 Now, customers can buy Alessi and ship internationally with Borderlinx! Determining cheap shipping, tax & duties upfront with our shipping cost calculator Borderlinx will then ship your item to your home country. A number of services are available through Borderlinx to make international ordering from Alessi hassle-free, including concierge, free repacking and consolidation services.